The Belize Tourism Board held its 12th Annual Industry Presentation on Friday, January 11, 2013, at the Island Academy in San Pedro, Ambergris Caye. The Board launched its five-year action plan and announced that it has a 20-year master plan for tourism in Belize, and these presentations were made against the backdrop of significant achievements in various sectors of the industry over the past year. Ian Lizarraga, Chairman of the BTB, said the Board has nothing but positive news to share with the people of Belize concerning the tourism industry. Laura Frampton, Director of Tourism for the BTB, said that the performance of the Board over the past year has been record breaking and that the Board looks forward to another profitable year for tourism in Belize regardless of the decrease in cruise tourism, which was down by about ten percent last year. “While we were down in cruise tourism, the overnight tourist arrivals were very strong,” she said. “Over a ten percent increase in overnight tourist arrivals of 2012 versus 2011. And 2011 also saw a five percent increase over the previous year, so we just keep going up in overnight arrivals. In fact, the first three-quarters were record-breaking months.” Frampton said that there was also a large increase in the number of licensed tour guides and tour operators last year. She said that the Board is looking harder than ever to promote Belize. The country had a great amount of publicity last year via several outlets, including a spotlight in the Mayan Calendar apocalypse watch, a feature on The Bachelor, coverage of the visit of Prince Harry during the Queen’s Jubilee tour, and as well, although not in a very positive manner, through all the media attention given to John McAfee’s escapades late last year. In noting the increases in overnight tourist arrivals, Minister of Tourism and Culture Manuel Heredia Jr. said, “To put this into perspective, the world tourism and travel council indicated last year that there was only 2.7 percent growth in tourist arrivals globally in 2012 compared to last year”. The Minister said that signified that tourism performance in Belize has been extraordinary and establishes the country as a major contender in the regional tourism market. He went on to recognize the BTB’s successes over the past year as a milestone achievement. The 20-year master plan that the BTB has unveiled is designed to further enhance the performance of the tourism industry and to build on those positive trends. On October 30, 2012, the government officially approved the first National Sustainable Tourism Master Plan. “This master plan makes plans for the national strategic guide not only for government and the Belize Tourism Board, but for each one for us,” Minister Heredia said. “It is there now to assist and guide us in the fulfillment of our individual responsibilities, while at the same time providing a systematic framework for us to achieve our collective goals and vision for tourism in Belize,” he explained. Minister Heredia said that implementation of certain initiatives from the master plan has already begun through technical and financial support. The first ever hotel and tour operator classification system has already been developed as an incentive for quality enhancement of both sectors. The BTB is installing a tourism information database system, and is also in partnership with NICH, for a cultural tourism program. “It’s again, not resting on our laurels and looking at ways that we could be dynamic and really stand out against our competitors,” she said. Also, the BTB is expanding its own internal structure to not only expand in areas of strength, but to address areas that require improvement. In efforts to lift the cruise tourism arrivals figures, the BTB will create a new position within the Board for a director for cruise and regional initiative. 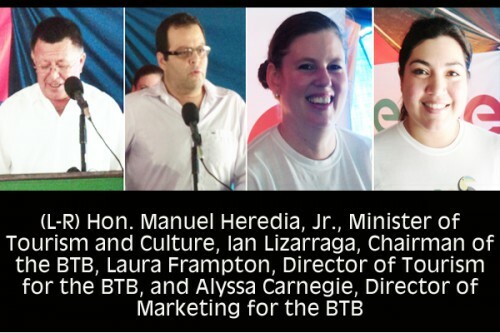 Director of Marketing for the BTB Alyssa Carnegie said that the Board, through its marketing department, has taken another step toward greater success by making efforts through new branding to give a fresh look to the organization, and the Belize tourism product. The highlight of the presentation was the revealing of the new Belize logo for the BTB. Although the logo still carries the jewel’s name and national bird, it has undergone a major facelift. Carnegie said that the shapes, colors and fonts of the letters and the toucan are all symbolic of different features of Belize, including the people, cultures, and environment. “A lot of research and work went into putting this together, especially in terms of shapes,” she said. “We’re informal by nature, we’re casual, we’re laid back, we’re approachable, and we’re not stand-offish. We’re a warm and inviting people and we really wanted to make sure that that translates in our new logo,” she explained. Carnegie said that the change was necessary for moving forward in BTB’s new campaign, “Discover how to be,” which is geared toward showing the world that “Mother Nature’s Best Kept Secret” is no longer secret and is now a premiere vacation destination. The 2013 Destination Belize magazine will carry the new logo. The BTB encourages the public to be on the lookout for the new logo and to look forward to a continuation of progress in the growing tourism industry of Belize.